One day after debuting as a competitor to red-hot streaming app Meerkat, Twitter-owned Periscope has already gotten the attention of brands, which are testing out what they can do with the live-video app. They are carrying on a recent tradition of companies quickly jumping on buzzy social tools. Although it's far too early to deem Periscope a "Meerkat killer," the four examples below at least give marketers ideas about how the app can be employed. 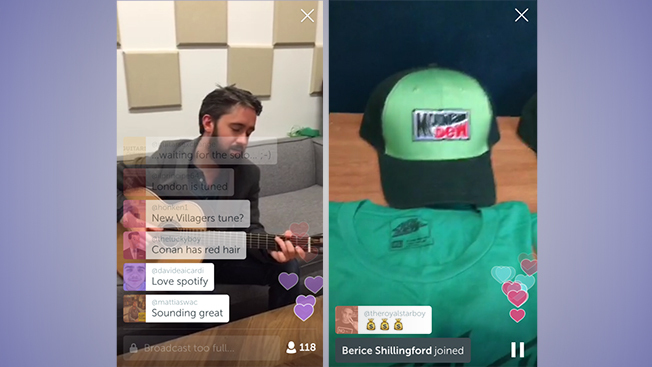 After joining Periscope yesterday, the music-streaming service posted a behind-the-scenes video with Irish folk singer Conor O'Brien from the band Villagers. During the live stream, 382 viewers tuned into the live stream, racking up 1,534 hearts—the equivalent of "liking" something on Facebook. The Pepsi-owned brand used the app on Thursday afternoon to create a short video titled "Stop by to say what's up." The short clip showed a girl spelling out the word "Swag" on a chalkboard with a table full of branded T-shirts and hats in front of it. DKNY's social account gave viewers a look into its fashion closet on Thursday, shortly after announcing it had opened an account via Twitter. Fashion brands already regularly employ Facebook, Twitter and Instagram to give folks a peek into its world, so it's likely that fashion-minded marketers will embrace Periscope.